I didn’t want to write a blog post today. I’m not feeling it. I’ve got a billion and five other things to do and surely another day without a blog post wouldn’t be that bad? It’s all right cause I’ll write one tomorrow. And it’s okay cause I’m working full time again and there’s loads of stuff going on. I can justify it by telling myself I’m tired/busy/ill and promise myself I’ll definitely do it tomorrow. But today I decided I have to write a blog post. It’s been too long since the last one and I have very definitely been throwing myself into scripts, writing and working. And I’m going to make myself do it, even though I don’t particularly want to. Even if it’s rubbish. Because at least then, I’ll have written a blog post and I know that the next one will be better (and hopefully way more interesting). It’s the same with writing scripts. Or editing your film. You need to make sure that you’re doing it regularly, that you exercise that muscle or else it’ll become stiff and then when you try to dive in when you think you’re ready, it’s a much harder slog. A little bit of writing every day will help you to become a better, stronger writer, who can create amazing characters and scenarios at the drop of a hat. The best thing about writing is that you can come back tomorrow and fix all your mistakes from today. In hindsight, perhaps writing a blog post about not wanting to write a blog post isn’t the best idea – as once it’s published, I can’t really rewrite it or tweak it. Or maybe I will. But at least I’ll have written something to make my blogging brain start to grind together again. And that way, I’ll be more aware of potential blog post topics (although any questions are always welcomed) and I’ll become used to the routine of writing a blog post every week once again. I’m going to be the first to acknowledge the fact that this is very definitely NOT the best post I’ve ever written. I knew from the very beginning that it wasn’t going to be. But you know what? The more I write, the better it feels. I’m working those muscles and getting back on track. It’s a point that I think a lot of creative people come across at some time and I’m ploughing through it. Pushing against it and making it happen. Determination to get through to the other side and have something to show for it. I do feel bad that this has been such a rubbish post though. Let me make it up to you. 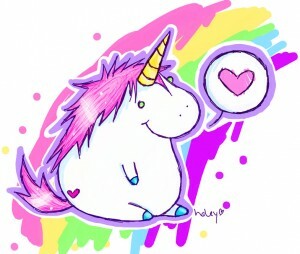 Have a unicorn on a rainbow. Research is, undoubtedly, one of the most important parts of writing. It doesn’t matter how good your script is, if you have moment that doesn’t ring true or doesn’t make sense, you snap your audience out of the story – and you never want to do that. Research is the reason I clear my internet browsing history once a week – some of the stuff I search could look quite strange to an outsider. I would even go so far as to say that research is THE most important part of writing. Note that I said important part. Research is oh so very definitely a part of the writing process. Just because you aren’t scripting, that doesn’t mean you aren’t writing. Looking into how things can actually happen – how a building would collapse, how to reshoe a horse, how to roast a turkey – is so important to the final outcome of your script. If you get it wrong, it throws people out of the story. I remember I once watched a show with a protagonist who was on the Tube on the Central line get a text message. Another film had visa regulations that were wrong. It broke the suspension of disbelief for me because the research wasn’t done right. Saturating yourself in the genre you’re working on – watching hours and hours of sitcom or romantic comedy films or slasher flicks – is part of honing your skills to write something fantastic. After all, how can you write something original if you’ve no idea what’s been done before? Never underestimate the power of research. You could stumble across a scene or storyline that’s exactly like yours. Then you need to figure out if you can make it different enough or scrap it. There’s nothing worse than pitching your work to someone who turns around and says ‘Oh, that sounds like The Godfather,’ but you’ve never seen it and suddenly your storyline is shot. If you’ve spent months slaving on the script, then where are you? Frustratingly enough, it happens. Never, ever beat yourself up if you spend a day watching something of your genre instead of typing ‘EXT. RAIL PLATFORM – DAY’. Getting all the information you can is a key part of arming yourself so that you can write the best possible version of your story when it comes to that. And that could be what sets you apart from the other scripts in the pile. It’s nearly mid June. Say you’ve got something coming up. Perhaps something like the London Screenwriters’ Festival. Say it’s coming up at the end of October this year. There is a fantastic opportunity for you to pitch something there, to talk about your work, to get yourself out there. But NOW is the really crucial time for you as a writer or filmmaker. You need to decide now what projects you’re going to take in with you. To be your answer when people ask you what you’re working on at the moment (they always do). To have something ready when they say ‘What’s it about?’ so you don’t end up rambling about your story and they end up getting confused or overwhelmed by your rough pitch. You need to decide now what you start to work on before you get there, so that you’ve got something to show for it. Even if you aren’t pitching (if you are pitching, you definitely need to do this around now), you need to know what your strongest projects are to talk about with other writers. Honestly, start thinking about it now. Put in the development time to get it to a readable place if it comes to that. If people want you to send them something, make sure you’ve got something to send. Give yourself the best possible shot to get something up and running out of it. I’ve lost count of the amount of stories I’ve heard of people saying ‘I pitched last year and got a lot of interest in my idea but I didn’t have anything ready so I never sent anything through.’ Don’t be that person this year. Be the person who has a strong idea, a solid pitch, a one page outline ready to send (or give out on the day – but ONLY IF THEY ASK). Consider what you want to get out of the festival. Then arm yourself with the tools to get it. You wouldn’t go into battle with just an idea of how it’s going to go and hope you’d win. You’d have weapons and strategies and concepts to give yourself the best possible chance of winning. Do the same at your festival and event. But start planning NOW. If you aren’t sure about your project or know it’s not prepared enough to pitch at whichever event you’re headed to, I run a script reading service and would love to help you out with your script. Find out more here. I recently stumbled across a tweet during a EURO scriptchat session about a month ago that I had the foresight to favourite to investigate later. It was a tweet that mentioned a book called Into The Woods by John Yorke (who has an impressive collection of credits – just Google him for a proper rundown, but he knows what he’s talking about!) and that every writer should read it. Two weeks later, I was battling with restructuring my feature and at a bit of a loss as to how to approach it as the beat sheets I was working with weren’t helping me as much as I needed them to be. So I went to Amazon and fished out the Kindle preview of Into The Woods and started reading. I have to admit, the beginning did take me awhile to get into it. But it was enough for me to buy it and start reading. What Yorke has put into this book is not only a breakdown of structure, but also the entire writing process. From script structure to character arcs, from dialogue to fractural beats, it’s a fantastic and informative resource on how stories work. Delving beneath Vogler’s Hero’s Journey and examining a five act structure, Into The Woods is exactly what I needed to help with my rewrite. Yorke’s angle is a five act structure. I found this infinitely interesting as this is definitely what I lean towards as a writer, even though it was always masked as three act structure. That doesn’t mean that one is right and one is wrong – think of it like a paintbrush. Every artist prefers a different style of brush but you can still use them to get a beautiful painting at the end of it. You might not use five act structure, but I think that the book has the ability to help every writer strengthen their skills and hone their craft – particularly in the beats of the second act where a lot of films often lose their steam. The way Yorke breaks down the five act structure has helped me immensely with restructuring my film – making sure the beats are right and on point for the story. He talks about mirrored beats in each act and how they compliment each other as the story goes on, which kind of blew my mind when I read it. It works so incredibly well and it’s gobsmackingly simple but so effective. The book discusses so many things: structure of television shows as well as films, which I found useful for a different project of mine. It talks about story at its core, the function of story in society and what stories mean to us as people. Characters, dialogue, subtext – there’s everything jam-packed into this iPad sized eBook (I bought the Kindle edition for immediate access, but the paperback is really handsome and I’m hanging out to get that one soon too). The only thing it doesn’t touch on is subplots, but I think you can apply the same theories to subplots on a more simplified level. It’s one of the best books on screenwriting I’ve read. Definitely in my top two (the other being Linda Aronson’s Screenwriting: Updated – the first book on screenwriting I ever read and I still think it’s the best one for a new screenwriter to read, before Snyder or McKee or Vogler) and I think everyone should read it, no matter what level of writer you are. Brilliantly for anyone in London, the London Screenwriters’ Festival are holding a Breakfast Club with Yorke next week, on the 7th of June. I’d recommend everyone who can get there to go, mostly because I can’t as I’m on the other side of the world right now. You can then all make me jealous by telling me all about it! Crowd-funding is becoming a bigger and bigger concept and conceivable way of raising money to create/make/help people move closer and closer to their dream. It’s definitely a much more popular way of raising money than even twelve months ago and more often than not, you have a conversation with an emerging filmmaker and they’re either thinking about, have completed or are in the process of running a campaign to crowd-fund their project. I’ve already talked about the crowd-funding campaign for With A Little Help From Our Friends here and here. They run through most of the things that I’ve picked up on that you can do for yourself to give you the best possible chance of hitting your goal. Nothing is ever guaranteed, but there are definitely things you can do to put together a fantastic campaign. The main thing I’ve noticed recently, as more and more campaigns get launched every day, is that often people underestimate the power of the internet. The internet is a huge, international being. Social media – the main way that word of projects and campaigns is spread these days – is a worldwide phenomenon. A crowd-funding project launched in Australia, can hit people who are on their computers in America, Ukraine, the United Kingdom. These people also have money that they can give to your campaigns. They also have friends that they can pass your campaign on to. More frequently, I’m seeing projects that have perks that are restricted to particular regions. A perk reward of a ticket for a local event in Brisbane is less likely to interest a contributor who is based in Denver and has no chance of getting to Australia for the dates. And yes, there will be some people who give money for the sake of giving money, but more often than not, the average person would like something for their money. Make your perks accessible internationally. Why cut yourself off to additional members of your audience? You spread the net as wide as you can so that you give every single person who looks at your campaign an equal chance of contributing to it. That doesn’t mean that you can’t have perks that are local – but make sure you have a range of perks that are accessible on an international scale. And open yourself up to dollars, pounds, euros, rupees, roubles – all of it! Time is something that we can never get back. That seems like a poignant statement, but it’s designed more to highlight the fact that when you get the time to do something you love, you should seize the opportunity with both hands and go for it like there’s no tomorrow. I’ve been freelancing since I got back from the UK and I’ve just finished up a job last week. I don’t really have any idea where my next lot of work will come from yet, but I’m relishing this chance because it gives me an opportunity to throw myself back into writing – something that has fallen by the wayside over the past few weeks. So I’ve decided I’m going to be disciplined with it. I’m realistic in that I’m not going to be able to spend all day, every day writing – as much as I might want to. But I’m definitely devoting a big chunk of my time to writing each day. I’ll start each day with a target list of what I want to get done – but I won’t make myself feel guilty if I don’t get through it. It will just mean that I’ll have more to get through the day after that. And the list will be flexible – if I plan to work on my feature and then my sitcom, but when I hit sitcom hour and I want to keep going with my feature, why would I stop? And by ‘writing’, I don’t mean just writing the script. Writing isn’t just scripting. Writing is planning. Sculpting the structure. Exploring story possibilities. Nailing characters. Writing the script is such a small part of it – never discount research or planning as ‘not writing’ because it definitely is. I know I’m going to start out rusty. I haven’t written seriously in nearly four weeks – there’s going to be a bit of squeaking as the wheels get back into motion. But I know that I love the worlds I’ve created and I want to spend time in them getting them right on the page so that anyone reading them can love them like I do. I know that when I get going, I’ll be flying. I just need to work on my take off. Today is deconstructing the structure of my feature to see if it is serving my story well enough. Then this afternoon is sitcom central. I’m off to make a cup of tea, then I’ll be heading off on the first of many writing sprints. 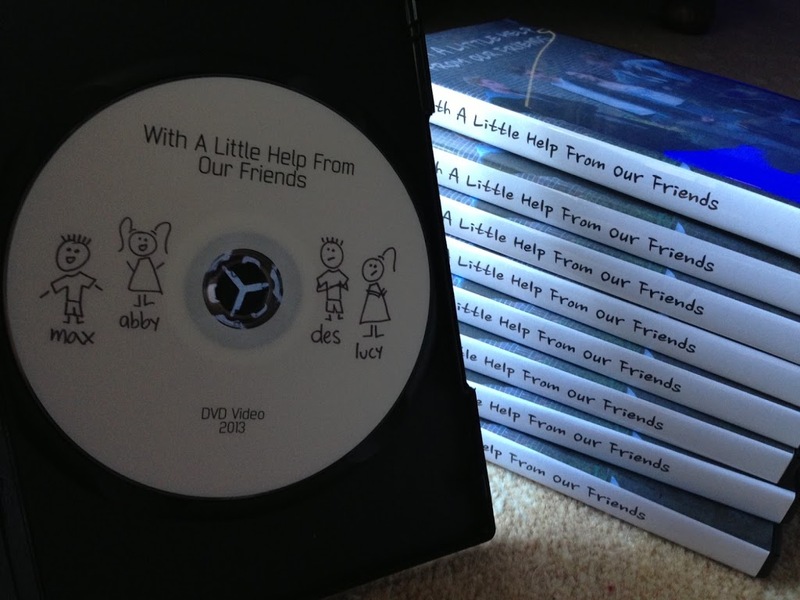 It’s with intense pride, relief and joy that I’m happy to announce that the With A Little Help From Our Friends DVDs have been posted (and hopefully most arrived by now)! They were posted out last week and I’ve had some people telling me that they’ve shown up on their doorsteps, which is really wonderful to hear. It was a bit of a process putting the DVDs together – designing the covers, printing, trimming, fitting the sleeve; designing the DVD menu; burning each DVD individually and trying to work out what design to put on the DVD itself. 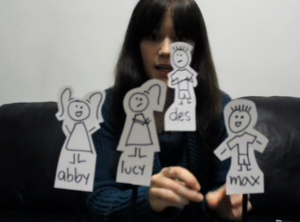 In the end, I was inspired by my sister who joked I should draw stick figures on them, which made me realise that I’d saved the figurines from the Indiegogo campaign pitch video. 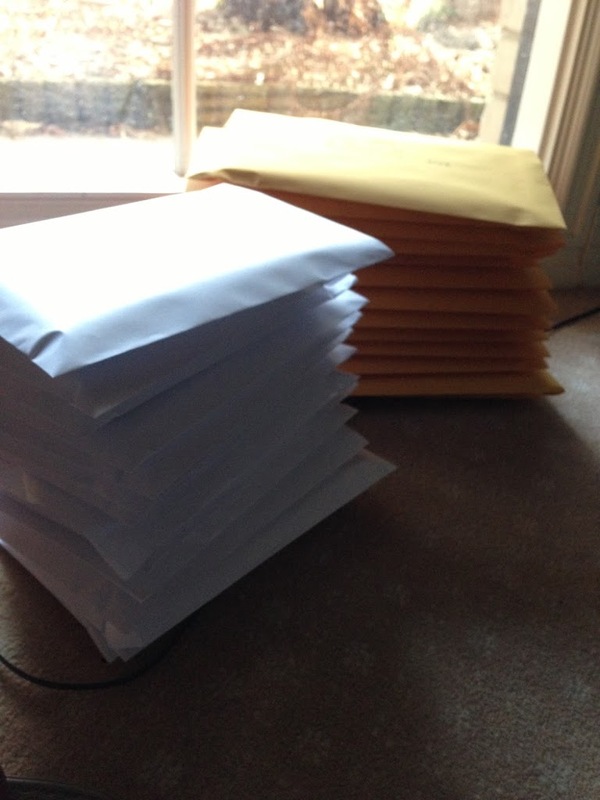 Once they were all packaged up at ready to go, I had to work out the best way to distribute the 40 DVDs around the world. I figured out that to send all the UK parcels individually to the UK would be the same price as sending them in one hit to Craig to post out again, so I decided to post them all from Australia. Some needed scripts, some were solely DVDs, all were hand addressed and packaged with lots of love and care by yours truly. 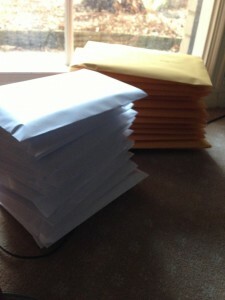 With several bags packed full of these, I trundled down to the post office to send them out. And ten minutes after I arrived, they were gone! Off to all corners of the world – from Moonee Ponds to Maidenhead, from Denver to Pontypridd. It’s a strange feeling, having done everything now. The film is officially finished. 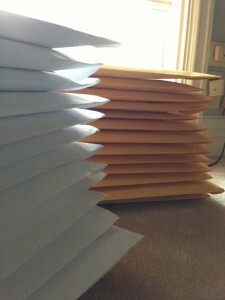 The perks have all been sent out. I’ve had some wonderful emails, tweets and phone calls congratulating me on the film – some even with favourite quotes included, which does wonders for your self esteem as a writer and your appreciation of your wonderful actors who can deliver a line (Markus, Danny, Carolina and Victoria, I’m looking at you!). So now, as ever, the next step. The next step in this case is to have a look into festivals that might be options to enter the film into. This is alongside writing other scripts and also toying with the idea of the next short film, one that I want to be bigger, better and stronger than With A Little Help From Our Friends. But right now, I’m going to focus on writing my comedy feature film and co-writing my television sitcom pilot and continuing to blog about random things that occur to me along the way. Thanks for being a part of the With A Little Help From Our Friends journey. I can’t quite believe it’s over, but it’s been absolutely incredible! 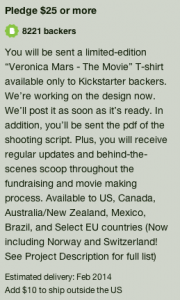 In the past few weeks, crowdfunding has become a hot topic once again thanks to the success of the Veronica Mars Kickstarter campaign. It’s been a hotly debated subject – is crowdfunding now dead to indie creators as it’ll start to be taken over by bigger studios who want to get a bit of extra money in their pockets? Or is it just the beginning of something even bigger? Who knows? But I think that every single person who is planning to or is running a crowdfunding campaign can learn so much from the way this campaign has been run and some of the reasons it’s been so phenomenally successful. 1. Build your fanbase early. Sure, Veronica Mars was on TV, with a pretty strong and devoted fan following in the years it was on. But they maintained the fanbase since the show has been off the air and when they put out the call to arms, the fans answered. And answered and answered and answered. There’s only a few days left of the campaign, but I reckon that they’ll still hit the five million dollar mark before their campaign is done. So get talking about your project. The easiest way to do stuff like this is to create your digital footprint. Tweet about it. Blog about it. Facebook page it. Make people aware of it. Give them as much access to the journey as you can so that when you need help, there are people there to give it to you. I reckon about 50% of the backers of With A Little Help From Our Friends were people that I’d met through Twitter since starting up the blog. They knew what was going on. And they were eager to help out when we needed to set up the budget. 2. Choose your limit carefully. Think realistically about how much money you need. Think of the dream about you want. Then settle for somewhere in the middle. Be realistic but not cynical about the amount of money you think you can raise. If I was to do the With A Little Help From Our Friends campaign again, I’ve probably set my target a little higher. That’s not being greedy either – we weren’t asking for much in the first place. But because I wasn’t expecting the support I got (in the end, we raised 132% over our target), we hit the intended amount in the first week. And often once you hit your target, people think that that’s it and the contributions slow down a lot. In a typical campaign, you get most of your contributions in the last twelve hours as everyone comes together to help push you over the line. Rob Thomas of Veronica Mars obviously thought that two million dollars was a stretch (which would be rational thinking! ), but looking at it now, if he’d asked for five million, he’d have probably raised that much by now too. Be hopefully realistic about your target limit. 3. Make your perks special. Your perks are the things that are going to seal the deal. Honestly. If your project looks amazing but your perks are expensive and not thought through, people will hesitate. And you don’t want to give your audience a reason to say anything but yes. Think about the logical steps of money. $2, $10, $25, $50, $100, $200, $500. Maybe with a few others in between. It’s entirely up to you how you structure your perks. But think about giving people value for their money. Research other campaigns that have been successful. Veronica Mars is a great example. 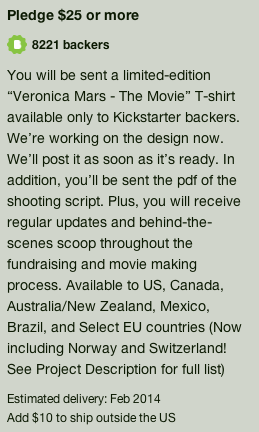 $25 for an exclusive t-shirt, exclusive pdf of the shooting script, regular updates and insights into what goes on on set. That’s a banging deal for $25 – especially if you’re a fan. $25 is often the most popular amount contributed to a campaign, so make it count. I remember a friend of mine once said that he’s happy to give $25 to a campaign as it’s like buying a DVD. This is a great point – if you haven’t got DVDs or t-shirts or tangible products until the backers start to hit $100, that’s a REALLY expensive piece of merchandise. 4. Make your pitch video count. With A Little Help From Our Friends – Crowdfunding Campaign from Alli Parker on Vimeo. That’s what this is, after all. A pitch video. Keep it brief and to the point – unless you have super cool awesome imagery like The Underwater Realm or The Fitzroy. But if it’s talking heads, get across your tone, story, what you need the money for and yourself. After all, you’re asking people to give you money to trust that you’ll deliver them a product. You need them to buy into you and your project – very literally. There’s loads of space to explain more in writing and I’d really really encourage video updates throughout the campaign as it really helps build a sense of personality and excitement around the project. And by leaving them wanting to know more, they’re more likely to read what the rest of the campaign is about. I really think that this is the key to running a strong campaign. Do your research before you start. There are loads of crowdfunding sites now – which is best for you? Kickstarter? Pozible? Indiegogo? Look into territories – Kickstarter is very US based, Indiegogo is UK based, Pozible is Australia but some support multiple currencies. Look into the wildly popular campaigns that have raised loads of money – what about them worked? Look into ones that haven’t worked and, sadly, failed – why didn’t they reach their target? What is unique about your project that you can offer? I think that crowd-funding is going to become a much bigger player in independent creative projects. It already has done in the few years since it’s been around. With more projects out there competing against each other for attention, you really need to look at how you can make your work stand out. But it’s not impossible to raise money this way – in fact, I think it’s getting easier as crowdfunding becomes more prominent in the world. You’ve just got to be smart about the way you go about it. I know what you’re thinking. It’s been a billion years since we shot With A Little Help From Our Friends, so why haven’t we seen anything in awhile? I want to thank everyone for their patience and support whilst we’ve been waiting for this to come around. And it has come around. I’m very pleased to announce that With A Little Help From Our Friends is finished. 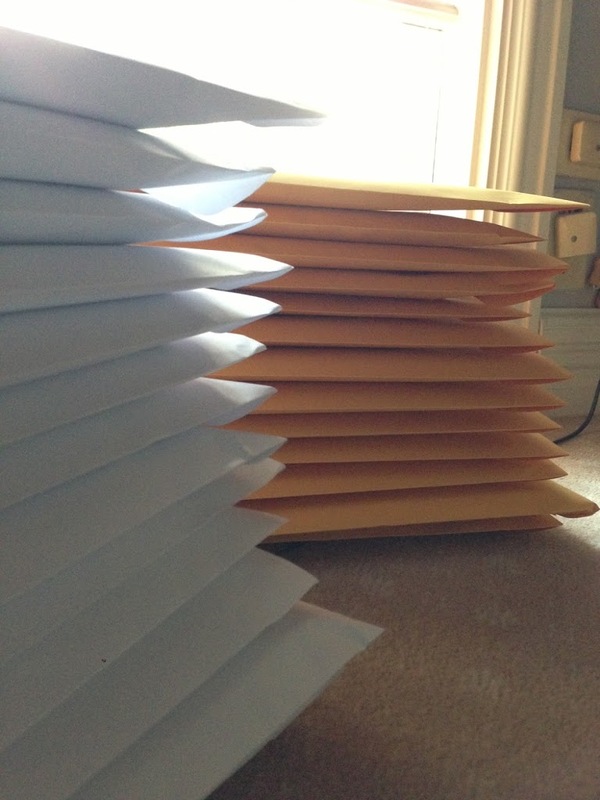 For all our backers on Indiegogo who gave us more than $10, look out in your inbox for the link to the completed film. For those who gave us more than $25, I’ll be in touch soon to double check your postal addresses to send the DVDs out to. It’s been a long time in the making – but it does go to show that filmmaking is a long process. And I know for next time to schedule my post production a lot better so that it’s not as time consuming the next time around. And despite how long it’s taken, it’s been a fantastic process! I’m looking forward to doing research into festivals over the next few weeks, once I’ve sorted out sending out the last few perks from the campaign. Thanks again to everyone who got involved and helped out – we could not have done it without you. 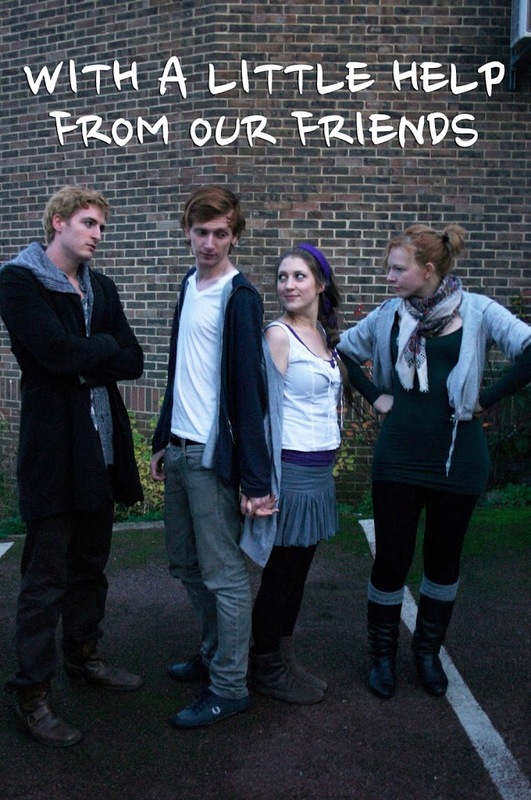 Hopefully it’s a little film that will make you laugh and you enjoy watching as much as we did making it!